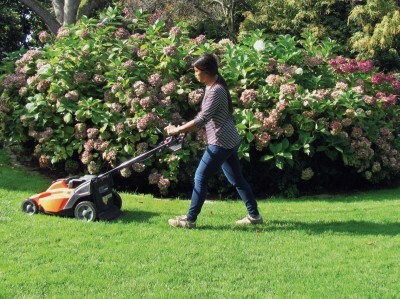 Natural yard care information is available for those who need language translation assistance. Call us at (206) 633-0224 to get help from a Garden Hotline educator with translation or download one of the translated brochures below. 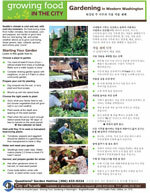 We offer the Natural Yard Care brochure in translation and Growing Food in the City as a bi-lingual publication. See the list for the language you need. For small group workshops requiring translation we often work with local community groups in your area. Please call us to arrange an event. 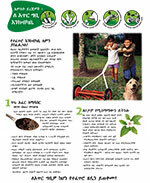 The Seattle Public Utilities has more information on natural yard care, including this brochure. The Seattle Public Utilities has more information on urban gardening (as well as these brochures). Save time and money, have a great lawn! Find a landscaper through our partner's website, EnviroStars.org. Learn about choosing garden products responsibly at our partner's website, GrowSmartGrowSafe.org or download the iphone app for use when shopping at your local nursery or garden center.